The Love Plus series is infamous for being the most extravagant and popular dating sim out there. Two weeks ago, I took the plunge and set out to gain a virtual girlfriend of my very own in the newest game in the series, New Love Plus+. The outcome? It is a solid, emotion-grabbing dating sim experience. New Love Plus+ is the story of three high school girls—Manaka, Rinko, and Nene—and you, the player character. After transferring into the school for your second year of high school, you meet each of the girls in some aspect of your daily life. Manaka is a member of the tennis team like you, Rinko is the president of the library committee to which you belong, and Nene is your coworker at your part-time job. As you spend more and more time at each of these activities—as well as running into the three girls in school or around town—you begin to learn more about each of their backstories. Each of the three girls has her own hopes, wants, and dreams—not to mention more than a few problems to overcome. Rinko suffers from problems at home—i.e., a new step-mother and step-brother. Manaka, on the other hand, has had such a sheltered life that while she excels at both academics and sports, she finds herself socially isolated. Nene is the big sister type that everyone relies on, but who does she have to turn to when problems arise in her life? As you play, you find yourself learning more about the girl of your choice, and you slowly but surely help her through her problems in the first half-a-dozen hours. This helps establish an emotional connection with your romantic foil. While at first you may only help out of sympathy, soon you are invested in her personal struggles and want to do anything you can to give her the happy ending she deserves. While most dating sims end with the girl confessing her true love to the player character, in New Love Plus+ that is just the end of the first act. Once you have won the girl of your dreams, you begin a relationship—in real time. Once a day, you can raise your stats and see some events from your continuing school life. Then, on weekends and holidays, you can invite your virtual girlfriend out on a date. These dates are full of cute scenes and mini-games. You can comment on her clothes and hair, take her out to dinner and a myriad of other date spots, and all the while attempt to get her to show some PDA. As she comes to love you more and more, you unlock new date spots and events. This half of the game is designed for the long haul—to be played over months or even years—and has tons of content to keep you coming back again and again. Much of the gameplay in New Love Plus+ is simple time management. Each day you plan out your schedule—which classes to work hard at, which school clubs to go to, and how to spend your nights. Each activity also raises certain stats—fitness, intelligence, artistic sense, and charm—while at the same time lowering others. Each girl finds you more attractive based on different stats: Manaka cares about fitness and intelligence; Rinko finds intelligence and artistic sense attractive; and Nene is interested in artistic sense and charm. Thus, you plan your activities around which of the three you are going after. However, in this game going after just one girl will cause you to miss out on some of the most interesting bits of the story—i.e., the way the girls interact with each other when they are both romantically interested in you. Of course, there is a bit more to it than simply raising stats. While you attempt to do that, the girls continuously give you special tasks which—when completed—improve your relationship. Of course, these events also take up slots on your schedule and thus prevent you from raising your stats as often as you would like. Moreover, sometimes the tasks of two different girls will both be scheduled to take place in the same time-slot—forcing you to choose one or the other. In the end, how much you enjoy the gameplay in New Love Plus+ is all dependent on how much you enjoy strategic stat building and time management. There is lots of character customization to be found in New Love Plus+—especially in the second half of the game. The girls try out different hair styles, clothes, and accessories to ascertain the look you most like. One of the most enjoyable parts of the game is seeing all the different ways they can look. However, the oddest part of the game is that they can also dramatically change their personalities. From time to time, Manaka, Rinko, and Nene will ask what type of girl you like. Based on your answer they will change to match your preference. While I understand that the personality change mechanic is all about allowing the player to create an ideal romantic fantasy, it clashes with the rest of the game which is centered around forming an emotional connection to the characters. If your choices for the direction of the plot somehow brought about a gradual personality change, that would be one thing. But changing their personalities like a light switch seems almost like a betrayal of the game's emotional core. 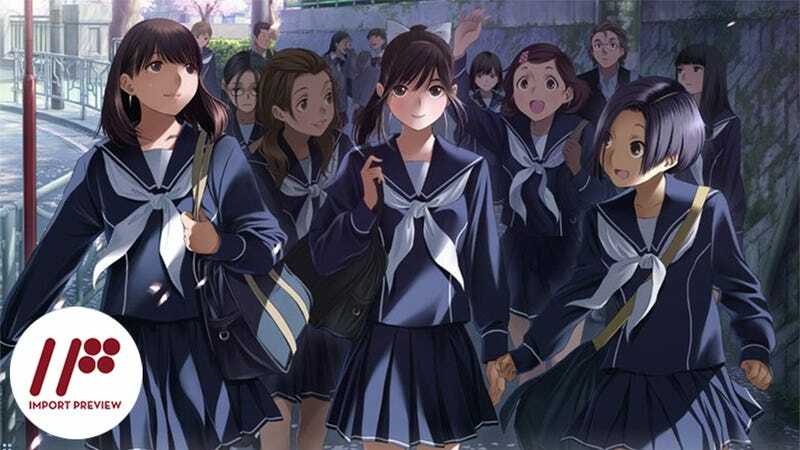 As far as dating sims go, New Love Plus+ does a good job of creating an emotional connection and definitely has the longest playtime value of any game of the genre I have ever come across. If you know at least intermediate level Japanese and have a Japanese 3DS, New Love Plus+ is the best virtual girlfriend experience out there. Just do yourself a favor and don't break the illusion by messing around with the personality changer too much. New Love Plus+ was released on March 27, 2014, for the Nintendo 3DS in Japan. There is currently no word on an international release.